station in Oldham in typical Manchester weather! Overall I was impressed with the frequency of the services even though I only used them during the evening! The Farm Shop on the A47 is a favourite stopping off place of mine. As well a good variety of food available there is often the off chance of a sighting of some buses and coaches. The rain had eased slightly for him to capture Belle Coaches Scania Omni Express BC11BEL in Just Go Holidays livery. Mayne currently has 94 vehicles in the fleet, 56 are based at Manchester whilst 38 are located at Warrington. I am also grateful to Harnser and Tim Miller for spotting the 'deliberate mistake'! The coach in question was Plaxton Panther bodied Volvo B12B PE56UJX of the Travellers Choice fleet, which looks as though it was last working on the C4 service, whatever that was! Authorisation:3 Vehicle(s). Transport Manager(s): STEPHEN PAUL FISHER New Condition: Three months original bank statements covering July , August and September 2013 to be submitted to the Traffic Commissioner by no later than the 31st October 2013. Attached to Licence. New Undertaking: Limousines and novelty type vehicles are not to be operated under this operator’s licence. Vehicles with eight passenger seats or less will not be operated under the licence without the prior written agreement of the traffic commissioner who may require agreement to certain undertakings. Attached to Licence. Effective Date: 15-May-2013. Other Details: Mondays to Saturdays. Operating between HEMSBY and MARTHAM FLEGG HIGH SCHOOL given service number 807/808/809 effective from 01-Sep-2013. To amend Route, Stopping Places and Timetable. Operating between Aldeburgh and Saxmundham given service number 64A effective from 01-Jul-2013. To amend Timetable. Operating between Lowestoft Bus Station and Beccles, Old Market given service number X22 effective from 17-Jun-2013. To amend Route and Timetable. Operating between Lowestoft, Dip Farm Car Park and Lowestoft, Marine Parade given service number A1 effective from 31-Aug-2013. Operating between Newport Beach and West Flegg Middle Sch given service number 809 effective from 01-Sep-2013. Operating between GUNTON ST PETER and BURNT HILL given service number 108 effective from 29-Jul-2013. Operating between Lowestoft and Green Drive given service number 115 effective from 29-Jul-2013. The major fleet operators also had a presence with Stagecoach in Gloucester represented by two Alexander Dennis Tridents 18315 KX05TWN and 18387 MX55KSN - both new to the Greater Manchester area. Applegates also operates deckers on school journeys including two former Brighton buses still in their former owner's colours. They were Scania N113DRB/ East Lancs 78 seaters registered P875VFG and P876VFG. A member of the East Anglia Transport Museum at Carlton Colville arranged for his daughter to go to her school prom in an unusual way. Both withdrawn Darts 43465 R465CAH and 43468 R468CAH are expected to depart for the scrapyard on Monday whilst 43470 R470CAH has been allocated to Lowestoft permanently. Mid-summer's day and the weather was anything but summery - cool and dull here on the east coast! Earlier this afternoon I did a quick tour of the usual spots in Great Yarmouth. A visit to First's Caister Road depot revealed six Darts dumped in the rear yard. One of the X1 Volvo B12Ms, 20515 WV02EUR, was also parked next to them looking a little sorry for itself . First EG52FGK with the unusual destination of Hemsby 1! Returning to the front of the depot, one of the Jersey Darts, 43862 EG52FGK, was being readied for service and was driven forward with Hemsby 1 as the unusual destination! Christian Newsome reports that Beccles based Nightingales are ending both of their routes in Lowestoft from the end of July. All First and Anglianbus services resumed their normal routes, although one Anglianbus 601 driver was seen to continue along the diverted route! The hole was reported by a bus driver on the afternoon of Friday 7th June with the main shopping street closed to through traffic almost immediately. There will also be excursions to local places of interest using the museum’s and visiting vehicles, which will be specially chosen to illustrate the development of buses and coaches in Britain from the classics of the 1940’s to the modern vehicles of today. Former Jersey Dart 43867 EG52FHC in action in Lowestoft yesterday. The first shows First Dart /Caetano Nimbus 43867 EG52FHC in action in Lowestoft yesterday. Cars were allowed access from Friday last (14th) with buses continuing on their diverted routes. He saw her chomping at the bit and ready to go in the doorway of the depot on his way in to work this morning. Also of interest is that the Anglian vehicles now only carrying their new numbers. Operating between Halesworth Railway Station and Latitude Festival given service number LAT3 effective from 16-Jul-2013. To amend Timetable. Operating between Latitude Festival and Southwold, Market Place given service number LAT2 effective from 19-Jul-2013. To amend Route and Timetable. Operating between NORTH WALSHAM and NORWICH BUS STATION given service number 210 effective from 28-Jul-2013. To amend Timetable. Operating between Holt Chrles Road and North Walsham - Post Office given service number 5 effective from 28-Jul-2013. To amend Timetable. Operating between Holt, Edinburgh Road and Cromer, Cadogan Road given service number 4 effective from 28-Jul-2013. To amend Timetable. Operating between Stalham and Cromer Bus Station given service number effective from 28-Jul-2013. Operating between N. Walsham (Park Lane) and Reepham High School given service number 615 effective from 28-Jul-2013. Operating between Sheringham, Station Approach and Cromer Bus Station given service number 22 effective from 28-Jul-2013. The three buses concerned are Dennis Javelin 11SDL/Plaxton Derwent II 109 CSK282 and two Scania CN94UN/Omnicity's 447 YN03WRF and 448 YN03WRG; all three have been sold to Ensignbus. I understand from Andys Busblog, that the fleet is indeed being renumbered and it will be in the same number series as the Konectbus fleet with both operators vehicles appearing on one joint fleetlist. the parish church and opposite the junction with Lovewell Road in the other direction. Earlier this year she passed to W E Jones & Son of Llanerchymedd and was observed in Conway during May still in Reynolds livery and retaining her former owner's fleet names. 43859 EG52EHD was observed on the 2, 6 and 4 routes this afternoon which makes three Jersey exiles now operating from Great Yarmouth depot. 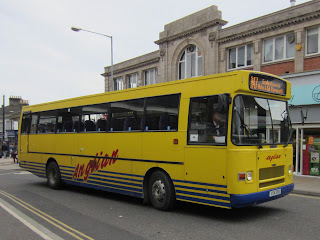 One would expect that such an influx of a large number of buses to the Great Yarmouth and Lowestoft area could lead to the withdrawl of some the older vehicles in the First fleet; so get your cameras out and catch them while you can! Suffolk Norse was established at the beginning of this year following a joint venture with Norse Commercial Services to take over the management of the fleet of school coaches and minibuses then run by Suffolk County Council. The Norfolk company took delivery of two new ADL Enviro 400s during April this year and both of them were loading as Grahame arrived. Grahame Bessey reports a further three arrivals at Great Yarmouth's Caister Road depot yesterday.